Why are so many of the majestic Canary Island Date Palms (Phoenix canariensis) declining?? Adult South American Palm Weevil. Aguilar Plant Care.2017. The SAPW is native to parts of Mexico, Central and South America, and the Caribbean. SAPW was first collected from infested Canary Islands date palms in Tijuana, Mexico in 2010. After physical examination by Mark Hoddle (UC Riverside-Director CISR) of the declined palm it was found to be infested with South American Palm Weevil (SAPW). South American Palm Weevils were later captured in monitoring traps in San Ysidro, California in 2011 (~ 5 miles north of Tijuana). 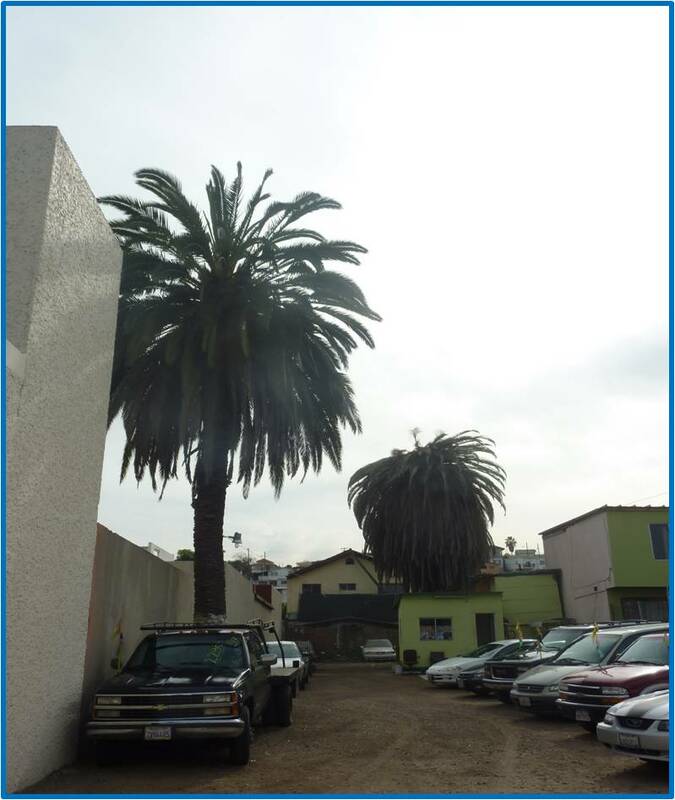 At the same time Canary palm mortality also began to spread throughout border cities of San Diego County such San Ysidro, Chula Vista, Imperial Beach and Bonita. Since the first findings in 2011, trapping and monitoring in the Bonita Sweetwater Preserve, Mark Hoddle and team are now catching “about 200 adult weevils a month, and Palm survey indicates urban palms being killed at a rate of about 3-5% every 6 months”. So far as of January of 2019, the furthest Northern area of San Diego County known to have a positive infestation is the Mission Valley (Friars Road) and 8 freeway area. South American Palm Weevil populations are considered established in San Ysidro, Imperial Beach, Bonita, Chula Vista areas. Welcome to IB! Dead Canary Palm as you enter Imperial Beach. Aguilar Plant Care.2018. Now areas near La Mesa and Downtown San Diego (near Petco Park) areas are now showing signs of SAPW infestations. Dead Canary palm from South American Palm Weevil across the street from Petco Park. Here’s a map made by Aguilar Plant Care showing confirmed mortalities of Canary Island Date Palms due to the South American Palm Weevil. This map is created and maintained with the help of many San Diego Arborist such as Alden Pedersen and Kurt Peacock who are big contributors in updating me when a dead palm is found in the county. The red dots indicate anywhere between 1-20 dead Canary Palms. The dots on the Sweetwater Preserve, 1 dot indicates about 50-100 dead Canary Palms. We have been monitoring with multiple traps in the North County with no actual SAPW findings. Aguilar Plant Care offers SAPW monitoring services that includes, station set up, pest monitoring and monthly station maintenance. SAPW trap set up in Carlsbad by APC. There has been Some”questionable” findings in Cardiff, Carlsbad and Oceanside areas, but has not lead to actual SAPW findings, so we will continue to monitor. Possible SAPW found in Cardiff 12/2018. According to Mark Hoddle and his flight mill studies, he indicates that male and female weevils are capable of flying over 15 miles a day or more if they chose to do so. So it truly is a matter of time before the South American Palm Weevils moves to the North County and other sections of San Diego and Southern California. Monitoring and palm mortality over the past 12 months do indicate the the SAPW is moving northward at a fast and steady pace. Mark Hoddle and team are working on finding a Biological control to help manage SAPW. They researching multiple parasitic flies and other natural enemies that can survive here and our region. Research is still ongoing. Currently we at APC have been researching and treating with insecticide applications on many Canary Palms and are finding some success. APC is finding that timely insecticide applications are protecting palms from being attacked. The use of systemic insecticides along with contact insecticides has proven to be the most effective. APC treating a healthy Canary Palm, next to a declining Canary palm due to SAPW.2018. APC has found that the spraying / drenching of the palms crown (meristem) in combination with a systemic insecticide applied to the soil and roots has protected palms from SAPW attacks. Other treatment options include trunks spraying and direct trunk injections. Knowing that each site and Palm are different, the development of a management plan is important. So if you do decide to treat, ensure that you hire a professional certified arborist and certified qualified applicator (QAL). Removal of infested, dying, or dead palms is expensive, potentially dangerous and should be undertaken by professional arborists. It is recommended that infested palm material (i.e., fronds and the bulbous top of the palm) be chipped. All transported material should be covered with a tarp and disposed of at a certified landfill that buries within 24 hours (or sooner) of dumping to reduce risks of spreading adult weevils into new areas either enroute to or around the disposal site. 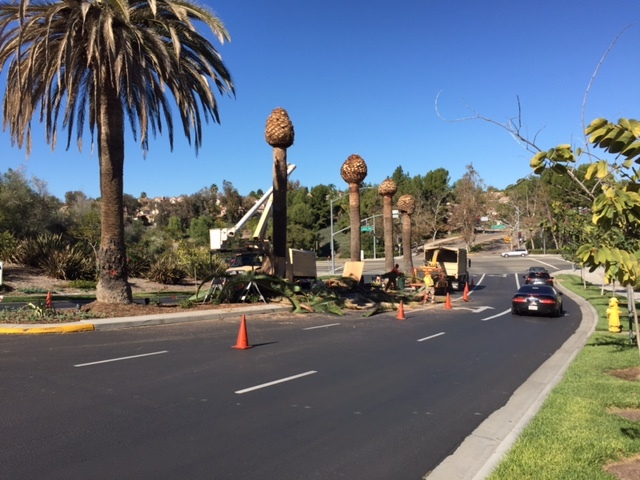 Removal of dead palms by Western Tree Service. If you suspect an infestation it’s important to report it. This will help track and monitor the pest movement. To report palms that may be infested with SAPW please visit this site https://cisr.ucr.edu/palmarum_survey.html and fill in the online document and submit it.